The Slam offers a unique combination of adjustability, durability and affordability! The Slam includes a heavy 4"x4" 11 ga. steel post. Our one piece post design eliminates the potential for joint deterioration common with sectional posts. The Quik-Pin� rim height adjustment design makes adjusting the Slam quick and easy. To adjust, simply pull the pin located on the back of the unit, lift the adjustment handle to the desired rim height, replace the pin and you're ready for action. The Slam is adjustable from 10' to 7' in six inch increments. The Slam's spring aided design insures that adjustment is effortless. 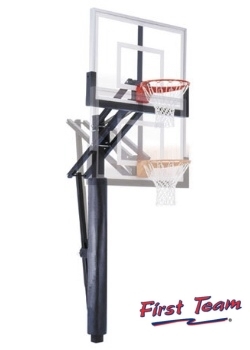 Various backboards and rims are offered with the Slam so you can choose the Slam package that fits your family. For additional safety, pole padding and backboard padding can be added to any Slam package. Every Slam package comes with a Lifetime Limited Warranty. Manufacturer policy prohibits showing our low price. Fill out and submit this form to receive IMMEDIATE pricing. Additional discounts on unit price and/or freight apply for multi-unit purchases. MAKE SURE TO INCLUDE YOUR EMAIL ADDRESS or PHONE.